The Jeu de Paume photography gallery next to the Place de la Concorde had some of its windows smashed during the “Gilets Jaunes” (Yellow Vest) riots in Paris on Saturday while several other art venues were closed to the public. Images posted on social media showed a car in flames in front of the Jeu de Paume but, contrary to several media reports, the art centre itself did not catch fire. “Faced with the worsening of the situation in the Tuileries gardens linked to the social movement, the public was evacuated from the building at 3pm [on Saturday],” says Alice Martin, the deputy director of the Jeu de Paume. “A vehicle near the Jeu de Paume was burnt but did not reach the building and there were no intrusions or serious incidents. The assessment of the damage on the exterior of the building is currently underway." The photography gallery remains closed until further notice. "The teams of the Jeu de Paume are doing everything to reopen as quickly as possible, taking the evolution of the situation into account,” Martin says. The Arc de Triomphe on the Champs-Elysées was graffitied by rioters; TV footage showed its interior ransacked and a smashed statue of Marianne, symbol of the French republic. French President Emmanuel Macron visited the Arc de Triomphe on Sunday, after returning from a trip to Argentina the day before, in order to inspect the damage. 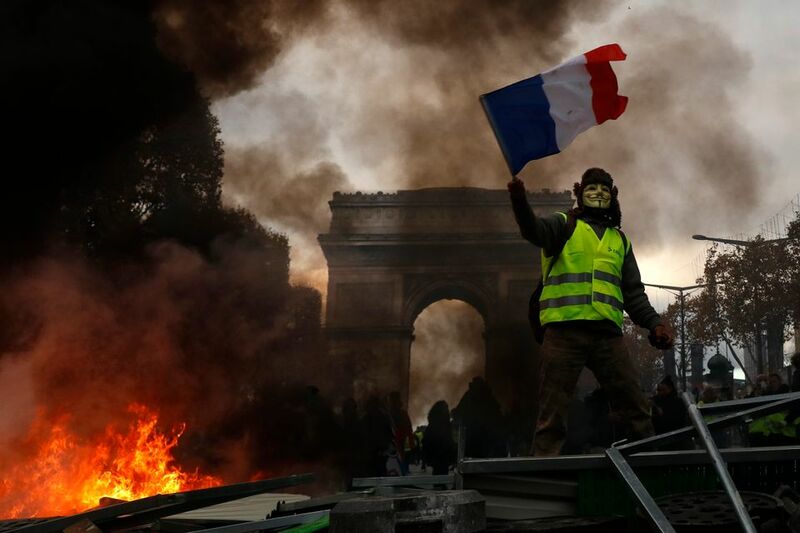 The demonstrations, which began several weeks ago against fuel taxes, have turned into an anti-government and anti-Macron movement, leading to the worst violence in central Paris in a decade. More than 100 people have been injured as cars and buildings were set alight. Facing his biggest crisis since taking office 18 months ago, Macron has instructed Prime Minister Édouard Philippe to hold talks with the protest groups and opposition leaders in a bid to quell tensions and prevent “professional” rioters from infiltrating street protests. The riots affected opening hours and therefore severely impacted on visitor numbers at several venues. The Grand Palais closed its doors on Saturday, and also last Saturday during the previous week's protests. Visitors with pre-purchased tickets to its exhibitions (Eblouissante Vénise, Miro and Michael Jackson On the Wall) are valid until 22 December 2018. The Petit Palais was also closed on Saturday. The Musée des Arts Décoratifs closed its entrance on the Rue de Rivoli, obliging visitors to enter via its secondary, back entrance near the Tuileries gardens. For security reasons, the Musée Nissim-de-Camondo in the 8th arrondissement closed its doors at 4pm. Artcurial auction house, which is located on the Champs-Elysées, was instructed by the Préfecture of police to be closed on Saturday. The previous Saturday, 24 November, Artcurial decided to postpone its Bandes Dessinées sale, scheduled at 2.30pm, until the next day (Sunday 25 November) due to the protests happening right outside the building. “This delay was regrettable but our clients perfectly understood the situation and responded by being present on Sunday as the results of the sale testified: the estimate surpassed €1.3m and a board by Moebius, Arzach, estimated at €20,000-30,000 soared to €114,400,” says a spokesman at Artcurial. Meanwhile, Sotheby's and Christie's—near the Place de la Concorde and the Champs-Elysées respectively—were both closed on Saturday. Sotheby's postponed the preview of its contemporary art sale to Sunday and Christie's contemporary and post-War viewing was open on Sunday, but not Saturday.